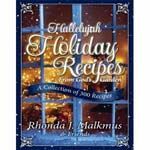 Holiday entertaining is a breeze when you treat your friends and family to the delicious holiday dishes created by Rhonda Malkmus and friends. In this sure to be classic book, Rhonda shares over 300 recipes - from Curried Butternut Squash Soup to Sweet Potato Casserole to Raw Apple Pie among other savory favorites. Even those not on the diet will enjoy this festive fare.